Magda Szubanski, ambassador for the Reading Hour in [year], For distinguished service to the performing arts as an actor, comedian and writer, and as a campaigner for marriage equality. Robert Thomas, long term member of the State Library of NSW Foundation, Council, and Public Libraries Consultative Committee, For distinguished service to the State Library of New South Wales, to business, and to the financial services sector. 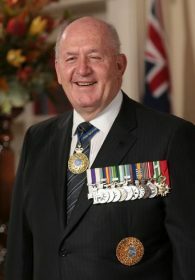 His Excellency General the Honourable Sir Peter Cosgrove AK MC (retd). For significant service to the community through charitable, health and cultural organisations. Member, Library Board of Victoria, since 2010. For significant service to the community of the Northern Territory through a range of organisations. Community: Chairperson, Northern Territory Heritage Council, since 2015. For significant service to conservation and heritage preservation, to public administration, and to the community. For significant service to literature as a children’s author and illustrator, and to Indigenous literacy. For significant service to the visual arts as an administrator and gallery curator, and to higher education. For significant service to literature as an author and publisher, and through roles with industry organisations. Author of over 60 books including: ‘Hunter’s Moon’, Random House Australia, 2015. ‘Australia’s Great War: 1914’, Scholastic Australia, 2014. For service to the museums and galleries sector. For service to the community of Wagga Wagga. For service to the community of Hay. For service to heritage preservation. For service to the community of Newcastle. For outstanding public service in promoting the inclusion of Indigenous heritage in Australia’s cultural and foreign policies.